Last year I received an email from Rod Hall-Jones, owner of ZK-ARH, the last surviving Spartan 3 Seater in the world. Built in 1932, it was registered as EI-ABU to Albert Clarke of Stoneyacre, Cloughjordon, Co. Tippererary. 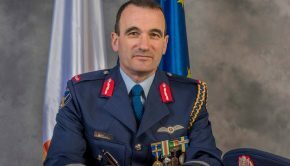 He regularly flew the aircraft up until the war years until it was grounded by the Ministry by removing the elevators. The engine was run regularly after this to keep it in good order. After the War Albert approached the Ministry to get these control surfaces back but unfortunately they had been lost and after some discussion the Ministry gave him an Avro Cadet as compensation! 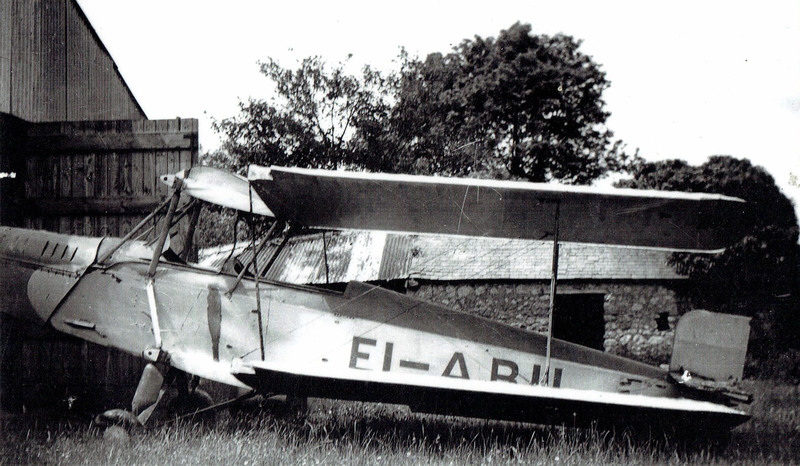 This Avro Cadet was ‘C7’, that is currently displayed at the Air Corps Museum at Baldonnel. EI-ABU in storage at Cloughjordan during the war years minus its rudder and aileron. The story goes (not verified) that Albert, being a handyman, rebuilt the elevators as the rudder is exactly the same and continued to fly it after the War years. The Aircraft is the very last of its type in existence, it has the original Hermes IV engine along with most everything else, there are date stamps on the woodwork along with placards. No blueprints exist as these were destroyed in a bombing raid on the factory during WW2. The Spartan remains in flying condition and the photo below was taken at Te Anau Airfield New Zealand where it is registered ZK-ARH. Built as a three-seat version of the Simmonds Spartan, the Three Seater was a biplane with a spruce and plywood fuselage. Although not many aircraft were built, the Three Seater was a mainstay of the pleasure flying business in the 1930s. The wings were designed to fold back easily, in order to be stored in a shed rather than requiring a dedicated hangar. 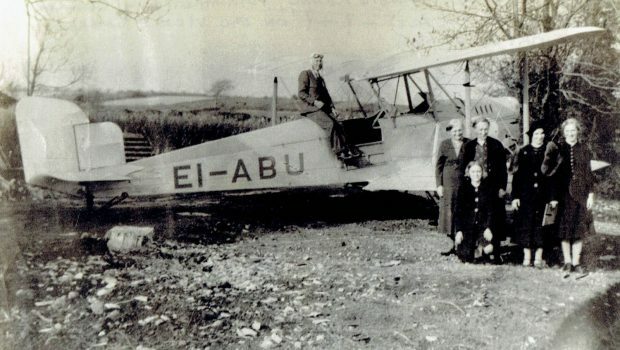 Following the first batch of aircraft, designated the Three Seater I, an improved version was built and designated as the Three Seater II (EI-ABU). The six Three Seater IIs had improved visibility for the pilot and easier access for the passengers, and were powered by a 130 horsepower (97 kW) Cirrus Hermes IV engine. The Avro Cadet, serial no. 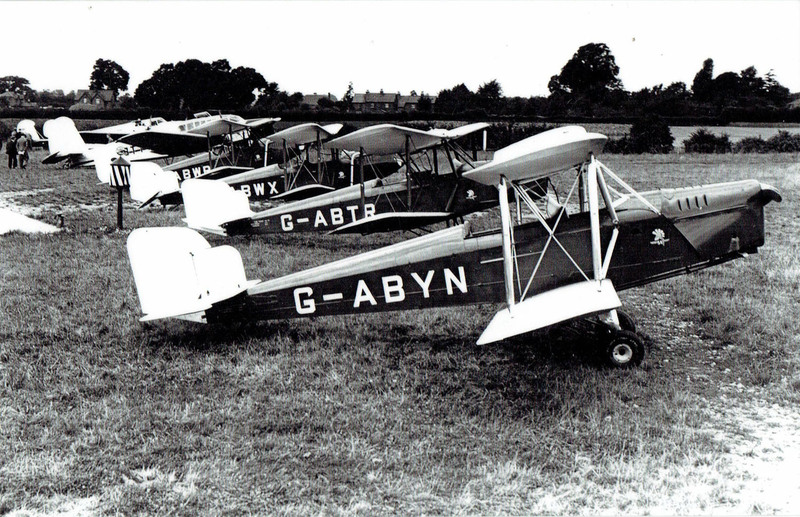 ‘C7’ originally entered service with the Air Corps in September 1934 supplementing six Avro 631 Cadet aircraft which had entered service two years earlier in 1932. Throughout its 11 years in service, ‘C7’ was mainly used in the pilot training role before being withdrawn from Air Corps service in August 1945. 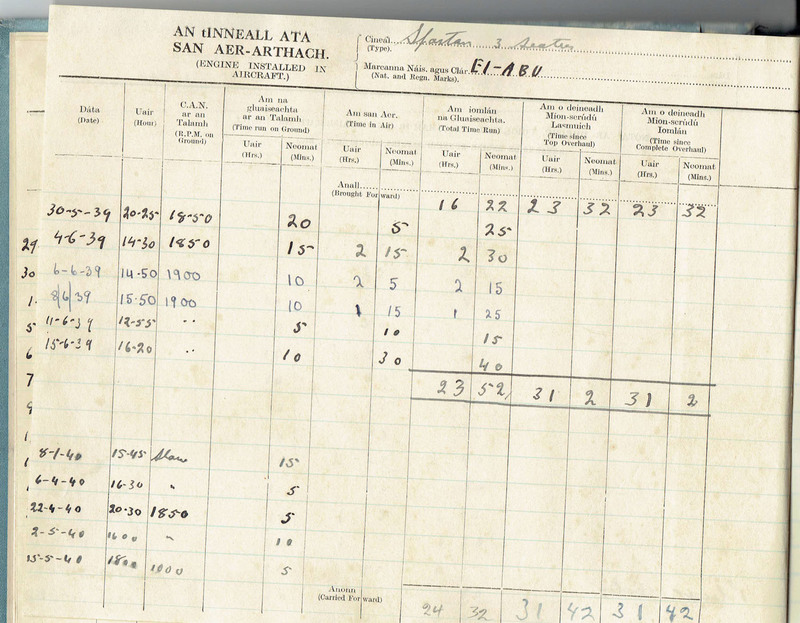 Its last recorded flight was on 28th August of that year and had 957 hours flying time. It was acquired (see above!) 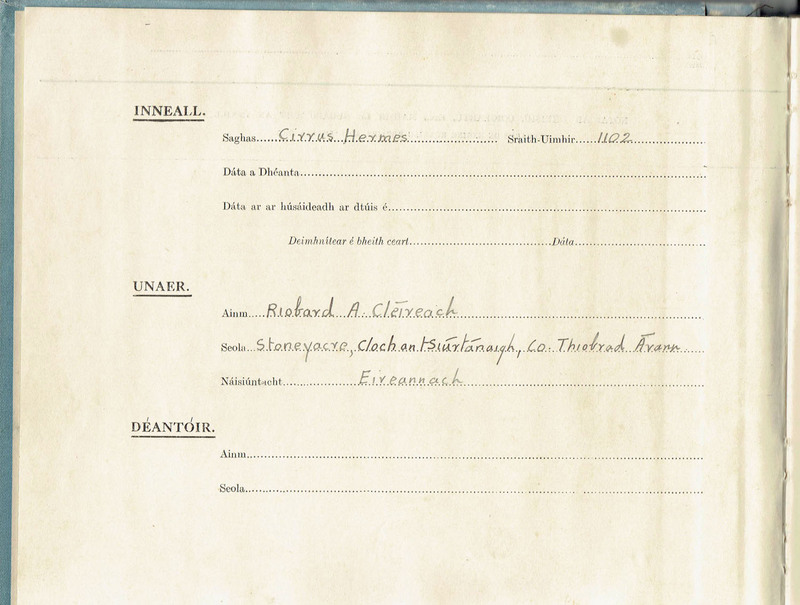 by Mr. Albert Clarke, Cloughjordan, Co. Tipperary and registered to him as EI-APO on the 10th November 1950, although no Certificate of Airworthiness was issued at the time. It was re-registered as EI-AGO to K.P. 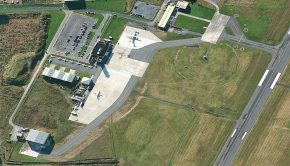 Lawlor at Weston, but the aircraft remained in storage at Cloughjordan along with the wings of another former Irish Air Corps Avro Cadet, serial C5. It was eventually acquired by Mr. George Flood who took the aircraft back to Dublin where he stored it in a shed in his back garden. When inspected in 1974, the aircraft still bore Irish Air Corps markings and colours despite being sold almost 30 years previously. It was subsequently sold in 1984 to Mr. Ron Souch of The Antique Aeroplane Company and arrived at Hamble, Hampshire on the 24th October 1984. Appropriate period marks G-ACFM were reserved for D. Ellis and the 1991 Air Britain Register stated it to be with Ron Souch at Salisbury Green. 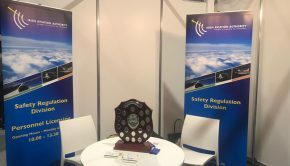 After a partial restoration, it was shipped to New Zealand, having being acquired by retired airline pilot Derek Ellis, and it was re-registered in New Zealand as ZK-AVR on the 30th October 1988. 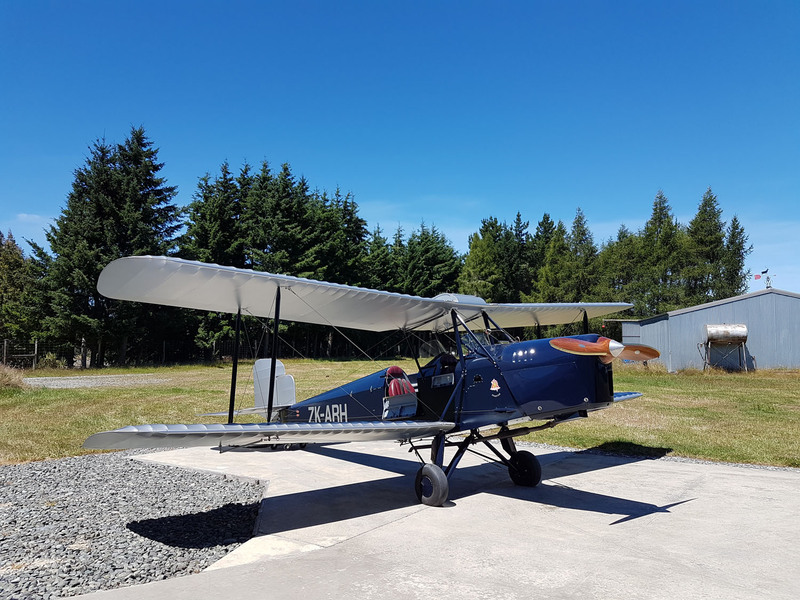 Its restoration was completed in 1999 by Smith Tech Aire, North Shore Airfield, Dairy Flat, New Zealand at which stage it was owned by Mr. James Schmidt. It was restored to full Irish Air Corps colours, and the New Zealand Civil Aviation Authorities allowed it to fly with no external display of its registration ZK-AVR, thus making its appearance totally authentic. 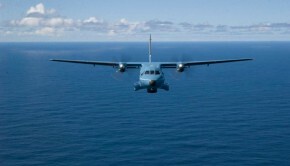 It was then based at Kaipara Flats, Warkworth, New Zealand, and had been on offer for sale for some time before the decision by the Minister for Defence in 2007 to purchase it on behalf of the Irish Air Corps Museum and Heritage Centre and return it to its original home some 73 after its initial acquisition. 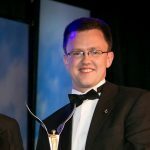 It arrived at Casement Aerodrome from New Zealand on Monday 20th August 2007. 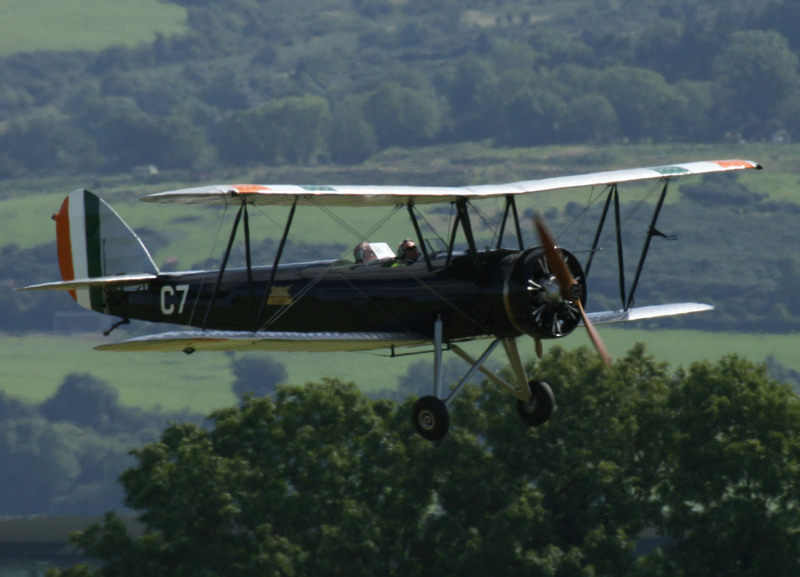 Avro Cadet C7 flying at the 2007 Air Corps Family Day shortly after being repatriated to Ireland. It was flown on the day by Brig. Gen. Ralph James.